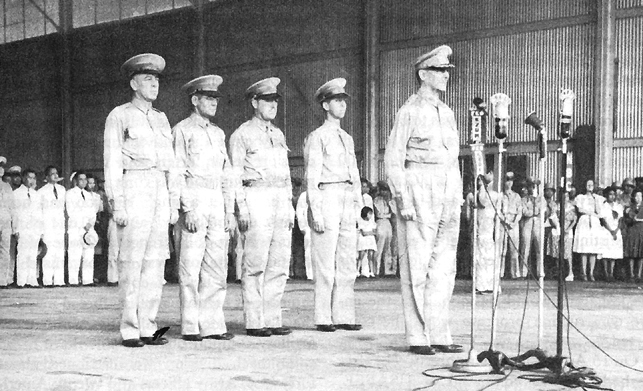 CEREMONY AT CAMP MURPHY, RIZAL, 15 August 1941, marking the induction of the Philippine Army Air Corps. Behind Lt. Gen. Douglas MacArthur, from left to right, are Lt. Col. Richard K. Sutherland, Col. Harold H. George, Lt. Col. William F. Marquat, and Maj. LeGrande A. Diller. When General MacArthur assumed command of U.S. Army Forces in the Far East, there was no program in the War Department for any immediate large-scale reinforcement of the Islands. As a matter of fact, the War Department specifically told MacArthur that he could have "no additional forces, except approximately 400 reserve officers to assist in training the Philippine Army. . . ." Within a few days, there was a complete reversal of policy in the War Department. The first sign of this change came on 31 July when General Marshall approved a proposal by the War Plans Division to reinforce the Islands' defense "in view of the possibility of an attack." The next day MacArthur was informed that he would receive substantial reinforcements and Marshall told his immediate staff, "It was the policy of the United States to defend the Philippines." 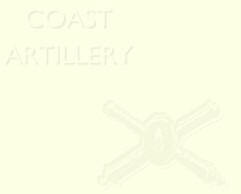 This statement so impressed the Chief of the War Plans Division that he entered it in his office diary. The reasons for this change of policy are nowhere explicitly stated.